About 7% of the books sold at community sales and at Friends of the Library book stores are sold at prices much lower than the actual value of the books. There are at least two reasons books are not priced higher at public book sales. One: a lack of knowledge as to which books are more valuable than others, and Two: the lack of a buyer who is willing to pay the actual resale value of a book versus the blanket price that books usually receive at public sales. The BookRecycler.org system finds books in your inventory of particular value that already have a buyer waiting through BookRecycler.org. When a book is located in your inventory with a buyer waiting, you are given a price quote representing a real resale value of that book. The price quote is the amount a buyer has already committed to pay for that particular book. In many cases, the price quote is multiple times more than the amount the book would be priced for sale in a public sale. You have the option to send the book to BookRecycler.org for immediate sale, or leave it in your inventory for sale at the book store or in a public sale. Again, the advantage of using BookRecycler.org is immediate sale, 24/7, at a higher resale price. 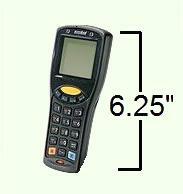 The bookrecycler.org portable bar code scanner. With BookRecycler.org, your resale books are screened with today�s most advanced book screening technology available. The BookRecycler.org bar code scanner contains a list of over 250,000 titles--all with a resale price quote and a buyer waiting for immediate purchase. The scanner is used to scan in the ISBN bar code on the back of books. If the book has a buyer waiting, the scanner will beep once and a price quote will immediately display on the scanner indicating the price the buyer is willing to pay. With a quarter-million titles with a buyer waiting, from 5 to 7% of your inventory is likely to be immediately sellable for a premium used book price. Any employee or volunteer on your team can use it to screen books in your inventory without a problem. The BookRecycler.org bar code scanner is fast, convenient, user-friendly, and the most efficient method of checking your books for value. Let us know you're interested with BookRecycler.org by clicking on the apply button below.